Picture books that share a moment in history can show us something that we have never seen before. They can make us wonder how an idea became a reality or how a problem was solved with tools of the day. 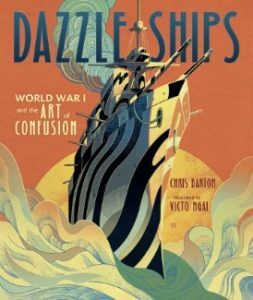 This was the case with Dazzle Ships by Chris Barton and ultimately what sent me in search of primary sources to accompany the book. Looking at a lesser known strategy used during WWI, the book explores the history behind dazzling or camouflaging British and American ships to confuse German U-boat operators. The lines and colors, when viewed through a periscope, altered the perception of the boat’s direction and speed, making it more likely that a torpedo would not hit its target. The picture book gives a strong background on the use of the military camouflage during WWI. 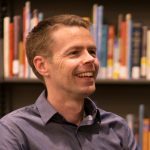 There are obvious connections to history, but also math, science, and other STEAM connections. If exploring STEAM connections with camouflage, you may first ask students how and why they would camouflage a large ship at sea. Some responses may be very high-tech. If so, focus the question around camouflaging a ship a century ago. It is unlikely any students identified camouflage similar to what was used on ships during WWI and also possible that they did not identify submarines as something ships could be camouflaged from. Share the story Dazzle Ships to introduce them to this type of camouflage. What were different ways that ships and other vessels were camouflaged? What types of camouflage seemed most effective? Why? What were the challenges in creating the camouflage? Other sets of primary sources, such as photos of the ships or photos showing how models were created and tested, reveal more about the dazzled ships themselves. As students view the photos and read the titles, encourage them to analyze the images. What do you see that is unusual or interesting? What details help to explain the how the camouflage may have helped the ship? How could you create and test these designs today? What questions would you ask a dazzle ship designer, pattern tester, or the captain of a ship or U-boat? 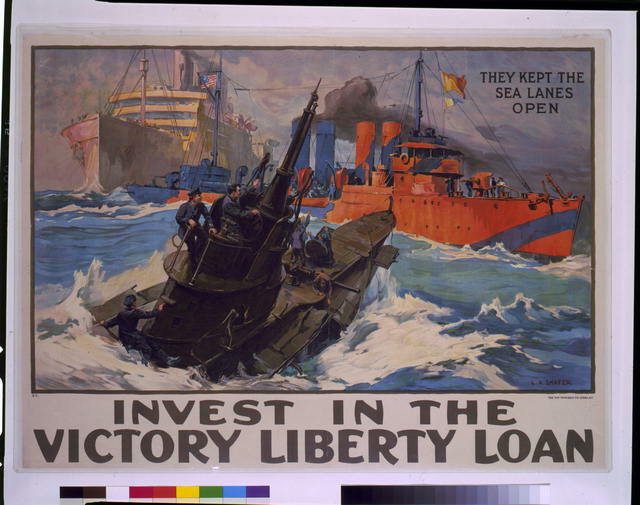 The background of dazzle ships and the insights gained from analyzing primary source articles and images give students the perfect background to explore their thinking through making. Exploring British and US ships built during WWI give a working catalog to draw from. Technology-rich environments may be able to create models using 3D printers or render 3D images. Low-tech solutions may be as simple as creating silhouettes of ships using cardstock or cardboard. 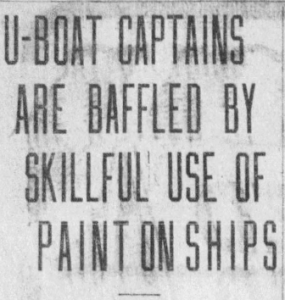 Students can then explore ways to camouflage the ships, painting them through dazzling or other methods described in the 1918 article. Colors can also be investigated using information from a primary source poster, oil painting, or newspaper article in the curated primary source set that can be used in conjunction with the picture book. Finally, students can test their work similar to how it was tested a century ago, creating a turntable, background, and periscope to test the effectiveness of the camouflage in determining the direction of the ship. Picture books and primary sources can give students an opportunity to investigate, wonder, and create.